I mean, I LOVE taking pictures, editing pictures..anything to do with pictures, I love it. For a few years back in the 90's I was a manager of a high end portrait studio. Ever since then, I had the bug. What I am not good at, is collaging pictures, something about it is SO tedious and time consuming! So, when I was offered to review Collage It I was SO excited. First of all, the download took about 2 mins, which is awesome! I hate programs that take 45 mins to downlaod. 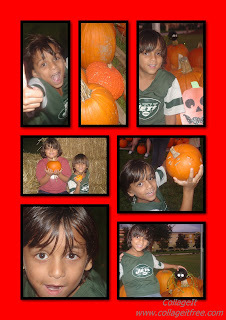 Second, the program is SO easy, I picked my photo's from my own folders, then added them to the pre-made collage and BAM! This is how my first collage came out, it seriously took me less than 2 minutes! Try it out for yourself and see how awesome and easy it is! I would need it for Windows.